So you’re interested in brewing your own home made beer? And why shouldn’t you be? It’s estimated that that 250,000 to 500,000 people in America make their own beer, which makes home brewing more or less of a great American hobby. It’s extremely cost effective, with kit prices being as low as $100 in some cases and ingredients being as low as $60 in other cases. It’s also a fun process that allows you to experiment with different recipes and provide yourself and friends with a superior beer that’s much less expensive than any commercial brand. If you’re on your way to becoming your own independent brew-master you’ll have a lot to think about. Besides what recipes to attempt, here are a few tips about the kinds of bottles you might want to look at for bottling purposes, and also what kinds of branding you may want to try. The Stubby: Shorter and flatter than standard bottles, having virtually no neck, stubbies pack into a smaller space for transporting. The bottles are sometimes made with thick glass and are therefore sturdier, and can also be cleaned and reused before being recycled. Stubbies are normally tinted brown or green, and very few American beers are bottled in the stubby. The Growler: The growler can hold half a gallon of draft beer, but also comes in a liter and quart size. The typical take-out beer, customers can bring in their personal growlers for refill from their favorite tap. One of the advantages of buying beer this way is that it is generally cheaper. Growlers are usually tinted a dark color. The Long Neck: Lastly, there’s the long neck beer bottle. The long neck is the most prevalent type of bottle used in America. Tall and slim with a long neck, these bottles are known as the ISB, or Industry Standard Bottle, according to the Beer Club. 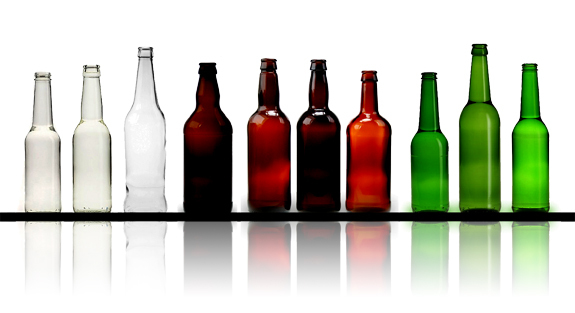 Long neck’s can be recycled and reused many times, and can come in clear glass and tinted. However, they are more highly represented by clear glass than other types of bottles. The bottle is easy to hold, and most consumers tend to hold the neck rather than the body in order to prevent their hands from warming the beer inside. Now that you’re more familiar with the types of bottles that are available you should begin to consider the types of branding suitable for your beer. Investing in custom beer labels is a wise decision as they are often less expensive than machine-placed labels and can come with more creative leeway, which will enable you to put your own authentic style into them. This is very important because you want your beer to emphasize your style as a brewer, therefore the label on the bottle should be as good as the beer inside the bottle. With that having been said, what you ought to consider first is the type of material your beer label will be made out of. Several materials to consider are foil, clear plastic, or high-grade paper. You should also consider the shape of your label and whether or not to include a neck label as well. Most importantly, the design of your label should have the most thought behind it. Just think of people’s reactions if you show up to a birthday party, holiday event, or even a wedding with your own brand of beer decorated with well designed labels. A wide variety of expertly designed, custom beer labels can be found at Labels on the Fly. Stay tuned for home wine and beer recipes and tips from Custombottle!